Did you know there was a book entirely devoted to the etiquette of taking tea? It’s true. It was written by our third tea party expert, Dorothea Johnson. Founder of The Protocol School of Washington, she wrote a book in 2000 called, Tea and Etiquette: Taking Tea for Business and Pleasure. She also writes the monthly column, Tea & Etiquette, in a favorite magazine of mine, Tea Time. Her most recent book release focuses completely on children and tea. It is titled, Children’s Tea and Etiquette: Brewing Good Manners in Young Minds. Perhaps introducing Ms. Johnson begs the questions I often hear. I find these questions ironic in an age where respect for other cultures is on the rise. Many people now understand, “When in Rome, do as the Romans do”. We want to be respectful of other cultures and not offensive. Less and less, we don’t expect other cultures to throw out their rules and ways to accommodate us. However, when we question etiquette’s relevancy, we question throwing out some of the best of our own culture. The taking of tea has played a key role in culture for many generations. It serves as a social means to connect with others. (Be sure to notice how often in books or movies, one invites another to join them for a cup of tea.) Ms. Johnson teaches what is expected of a guest and a host. This enables them to honor one another in their respective roles. 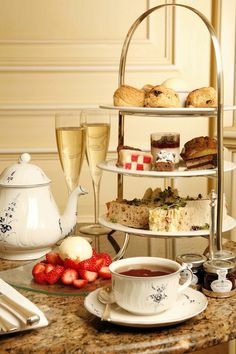 At tea, as in any other interaction, we are not free to act merely as we please; but we must act with mutual consideration, as befits our interdependence. As a native Californian, I appreciate feeling comfortable at the beach or rock concert and at The Ritz. My children run through streams barefoot and make mud pies. I also want them to not call me in a panic someday if their job interview will take place over tea, a common practice for some businesses. Dorothea Johnson has made it her life work to train us in etiquette and guard the elegance of taking tea. Training in etiquette has not gone out of style. Unfortunately, I think etiquette training has gone out of style, aside from those of us who still appreciate general rules of conduct. But I live in a state where etiquette is normally scoffed at too, so it may be more accepted elsewhere. Personally, I love etiquette, and wish more people would take the time to learn just the basics. It really does make life so much easier at times…essentially, it’s just learning to be polite.